The LX Solids Separator™ is a high capacity shale shaker linear vibrating screen that uses a high frequency multi motion vibration. 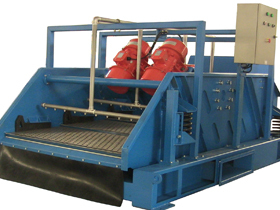 This oil drilling shaker screen is designed to separate solids from liquids and is mostly used in the shale gas and oil drilling process. 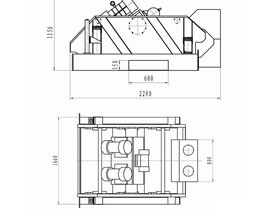 This vibrating screen is also great for screening slurries, mud separation, de-water solids, coal cleaning and screening of plastics and minerals. This vibratory separator features easy to change and clean screen – wedge screen technology makes this shale screen shaker ideal to separate difficult-to-screen solids. A unique characteristic of the LX Solids Separator™ screen shaker is the ability to integrate multiple vibratory motions in the same process; making this vibrating screen ideal for screening paper coating slurries and recovered coatings. The LX Solids Separator™ screening machine is also highly used in applications where high rate liquid and solid separation is needed. The LX Solids Separator™ integrates multi vibration motion technology making this oil screen shaker separator highly efficient over performing other rectangular screeners when screening and separating difficult liquids and solids. This advanced shale oil rig shaker features easy to replace screen and quick access to parts cutting maintenance and reducing downtime. This shale shaker also features high frequency foot mounted vibratory motors which eliminate high maintenance shafts and bearings. Controlling costs is a key goal in almost any industrial processing facility. With fewer parts to replace and longer lasting screens and motors, this shale shaker screen separator is aimed to save your company time and money. The linear screen design of the LX Solids Separator™ and multiple motions allow this vibrating screener to effectively de-water and separate oil and shale gas to a very dry point. The spray bars technology incorporated in the LX Solids Separator™ facilitates the screening of difficult solids and liquids making this rectangular screener much more efficient than other conventional vibrating screens. Charlotte, NC-based VibraScreener™ is a recognized industry leader in the development of cost-effective, innovative industrial screen shakers. We partner with many major corporations around the world, including Fortune 500 energy and mining companies. The LX Solids Separator™ shale shaker builds on this long industry expertise to help with a wide range of oil and gas and mineral processing applications. If you would like more information about the LX Solids Separator™ shale shaker vibrating screen and how it can help in your process, contact us today and a screening and separation specialist will be happy to assist you.